haha its pretty humorous and reminds me of a conversation Sylvia and I had today about the pains you have to go through on social media to erase past relationships with tagged photos. It can also be really funny to watch people go through relationship drama by changing their relationship status frequently. 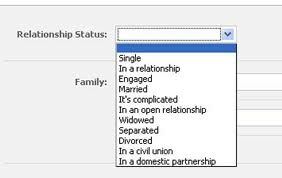 I personally favour the ‘its complicated’ status as it implies ‘don’t ask, its none of your business’. Myself, I’m not willing to provide any of these answers, because they all can have uncomfortable ramifications in the wrong context. Good point Tana- and online you never can be too sure who your audience might be. Pretty creepy app. And there’s lots of them out there!